So you’re picking up a broken bike, taking a dirt bike to the track, or whatever, and you’ve got to strap it down. Here’s some advice on how to do that. DO: Get a proper ramp. There are hundreds, probably thousands, of videos on YouTube of people dropping their motorcycle while loading it into a truck. 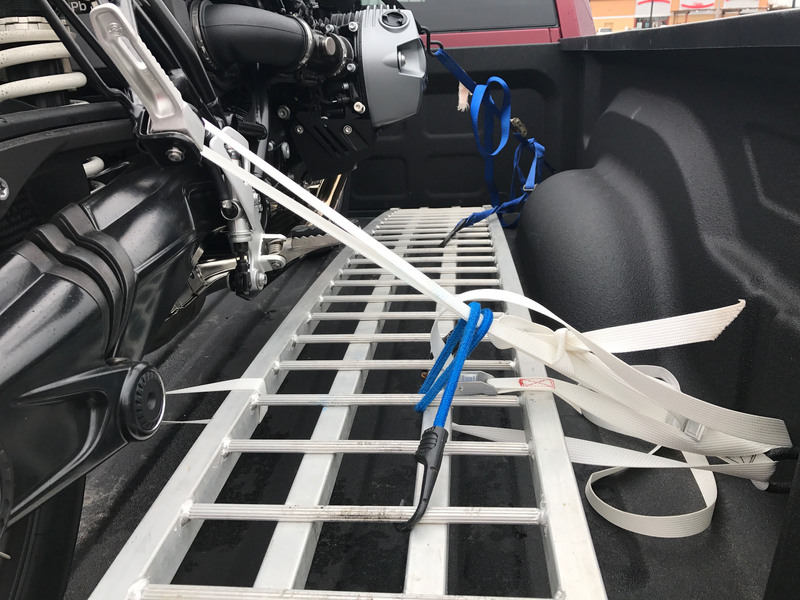 To strap your bike down, you’ve first got to get it into the back of your truck or trailer, and you need ramps to do that. Keep an eye on your local hardware/auto store flyers; cheap steel ramps can be had for as little as $50. though aluminum is lighter and easier to handle. And walk the bike up the ramp, don’t try to ride it, unless your friend is shooting one of those YouTube videos. DO: Put your kickstand up, if possible. 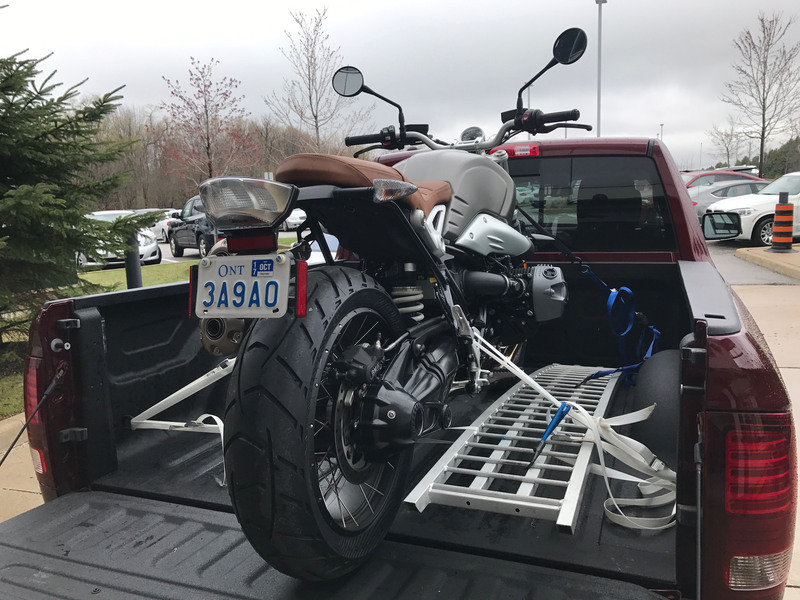 Everyone agrees the best way to transport a motorcycle is to centre the wheel in your truckbed or trailer and then hold the bike in the upright position with straps on each side keeping it in tension. This stops your kickstand from digging a hole into your vehicle, or from buckling under strain. Kickstands have been known to break under strain, and if it comes apart while you’re traveling at speed, you’re in trouble if you’ve used it to support the bike. However, there are occasionally scenarios where you have to put the kickstand down for some reason: usually because the vehicle you’re using to haul the bike doesn’t allow a centred carry position. If this is the case, make sure the kickstand won’t punch a hole through your truck bed or trailer floor (place a piece of wood under it, if needed), make sure it can’t fold back, and make sure you’ve got safety straps in place so if worse comes to worst and the kickstand fails, you don’t lose your bike off the back. The kickstand is down here, but it’ll be pushed back up once the bike is properly strapped into place. DON’T: Forget about Newton’s Third Law of Motion. “For every action (force) in nature there is an equal and opposite reaction.” When you’re strapping the bike down, make sure it’s secured from all the forces that could act on it — braking, acceleration, side wind, turns, etc. DO: Use the right straps. Even low-end ratchet straps work well as tie-downs, but cheap cam buckles can be trouble. Cam buckles can be decent secondary or safety straps, but unless you’re using high-quality cam buckles, don’t use them for the important straps. Having said that, some manufacturers do use cam buckles for shipping bikes, but they’re much better quality than the $5 specials at your local hardware store. DO: Have enough straps. You can get by with as few as two straps for the job, but you should have at least four for safety (two on the front, two on the back). A fifth or sixth for safety would be overkill to some, but necessary for other, more cautious motorists. 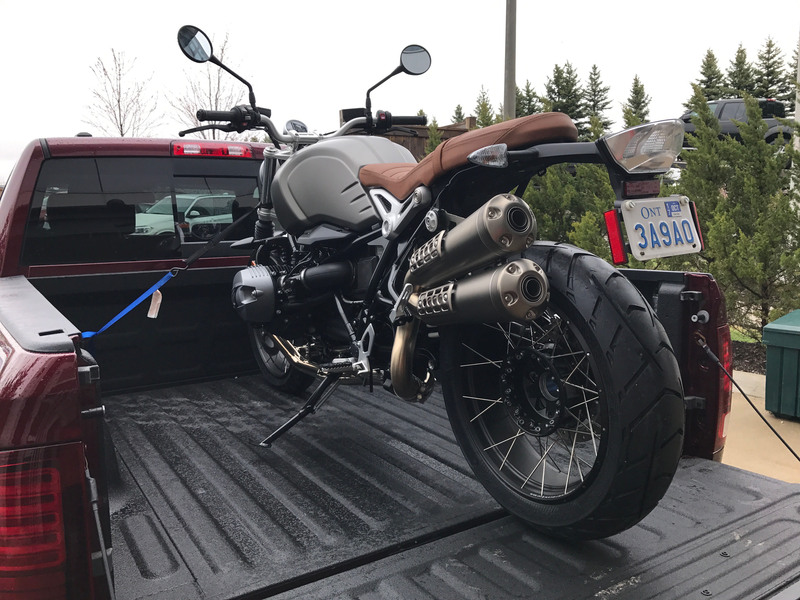 The BMW Scrambler is held in place by tying down the front forks, then its back end is secured by tying down the rear footpegs. Note the aluminum ramp, also tied down. DO: Think about your tiedown points. On most bikes, you’re going to want to use the handlebars to attach the tiedowns up front, and the passenger pegs or rear subframe as a tiedown point in back. But be careful, as ratcheting too tightly on things like switchgear or a throttle tube can break plastic bits. The front forks or triple tree might be a better option in some cases in the front. And if you want to run a safety strap or two, consider using the footpegs. They’re pretty hard to scuff up, and are very solid. DON’T: Trash your bodywork. As you’re getting everything tied down, think about where the straps are routed. Will they rub against the bike’s bodywork during travel? Maybe the wind will vibrate the straps against the fairing? If there’s a chance of the tiedowns somehow touching your bike’s plastics, you should try to re-route them. If that’s not an option, then use a soft cloth (think chamois, etc.) to wrap them and stop any damage. DO: Compress your suspension. Use your suspension’s rebound to keep the bike in place by compressing it and then tightening the straps. You can’t tie down one side without tying the other, and here the rear end is firmly secured. The kickstand is still down but not actually touching the truck bed, and will be placed up before driving away. DON’T: Overtighten your straps. This is a good way to blow a fork seal by compressing the suspension too much. Remember, your bike is still going to be moving around when you drive over a bump. That could be enough to blow the seal, if it’s already weak. As well, if your straps are too tight, you run the risk of having a tie-down point on the bike, or the truck/trailer, break loose. A small amount of flex should be left on the straps, though not much. Ready to go! The Scrambler (and the ramp) is safe and secure in the back of the truck. DO: Double-check everything when you’re done. Did you loosen up the slack in one strap when you tightened up another? Has the bike shifted now it’s strapped on all corners? DO: Consider options to make the job easier. Products like the Canyon Dancer bar harness, or a wheel chock that installs in your truck, will make it much easier to haul your bike if you’re doing this on a regular basis. If they prevent a tipover, they’ll pay for themselves immediately. These are the best straps I have found for securing a bike, and my hunt has probably been an unhealthy amount of effort. -They have clip on style hooks, that will stay attached to the bike if/when an aggressive maneuver to avoid a motorcyclist that pull out in front of you (ask me how I know that). 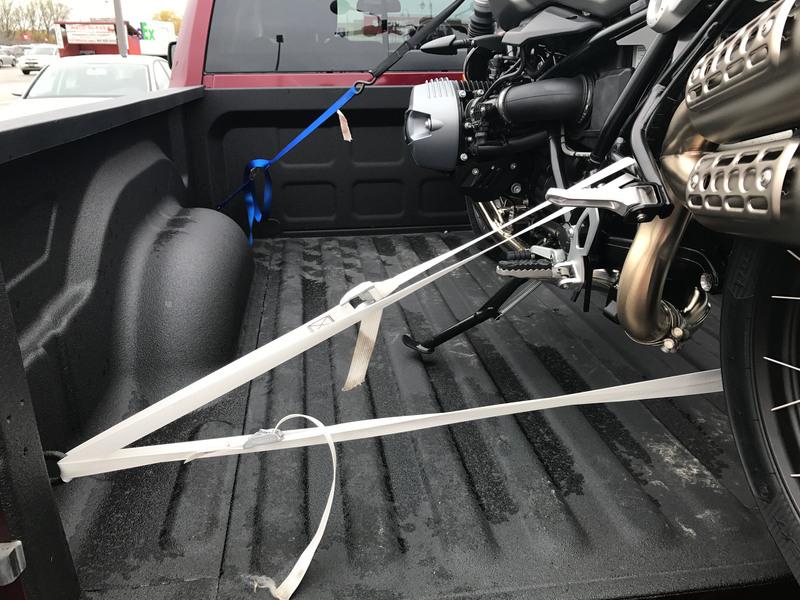 Even if the bike somehow kicks out of its resting position the straps will keep the bike and the truck/trailer connected to each other. -They have a loop of strap to wrap around and hook onto at one end to go around your triple tree/bars so you don’t have to hook directly to the bike and damage the finish. -One end swivels to straighten out the straps. -There is a Velcro tie to secure the excess strap once secured. -They ARE cam lock of decent quality. My issue with ratchet straps, especially on dirty bikes (motocross, dual sport etc) is that because they have so much travel you have to crank the ratchet a million times to adequately compress the suspension, not OVER compress, just adequately. When you release one side of the ratchet you end up with a ton of compression on one side and none on the other and it (can be) a wrestling match to keep the bike from flipping over. Further more, most ratchet straps, until you get into the $50 for one range that truckers use are cheap junk, they jam, or otherwise generally f**k up. Where did you buy yours? I use a piece of 2×10 as a ramp (max weight 350lbs, low trailer deck) with a piece of 2×2 angle fixed to the bottom on one end. The angle is cut to fit into a stack pocket on the back of the trailer to prevent it from sliding off. For loading onto a truck, the angle sits against the tail gate to keep it from sliding forward and an eye bolt on the bottom of the ramp (about midway) is used to put a strap from the ramp to a fixed point on the truck such as the trailer hitch/receiver..
As far as compressing the suspension is concerned, I have a short piece of 2×4, that is made to fit between the top of my fork brace (top of tire before fork brace) and the front fender attachment point. This allows you to snug up the straps nicely without compressing the forks much at all, also takes the bounce out of the suspension. Works very well for me and the bikes I have hauled, but certainly not a one-size-fits-all type of thing! Be careful that your handlebar is torqued correctly. I had handlebars move once, dug a big dent in my tank and the bike was loose to move around. Not a happy situation. Usually 2 ramps work best. One to roll the bike up on and one to walk on beside the bike while holding and steering it. Using a VERY low (and narrow enough) trailer, loading may only require a single ramp, as the loader can work from ground level at either side. Most of the problems in loading onto a pick-up truck result from the height of the damn truck bed from the ground and the attempt to use too short a ramp or plank, leaving too much of an angle between truck bed and the plank – which then causes the frame or crankcase of the bike to hit the plank or ramp, resulting in disaster. A chock for the front wheel to hold it (and the bike upright) on the trailer prevents forward and rearward roll. Padded end-loop straps prevent damage from strap hooks. Tape to prevent tie-down strap loose ends from flapping about. A cable lock to secure the bike to the truck or trailer when parked at gas or restaurant stops is a good idea as well. Yes, good points. I always use two ramps, although in my (not too-distant) economically strapped past, have been known to make do with a single 8′ 2×10 … and narrowly avoid disaster. Some argue you should tie down the unsprung part of the bike, ie. fork lowers and swingarm, so that the straps can’t loosen. If it must be on a stand, I’d say use the sidestand. Imagine a rolling ferry in high seas; if on the centrestand, the bike is almost always unstable since it’s pitching off the centre. If on the sidestand and strapped down, it takes a huge roll to put it even to upright, much less over the centreline, and unless it’s a very top-heavy bike, rolling towards the sidestand just fixes it more firmly to the floor. I like tying down the unsprung parts, but they’re fairly low on the bike, and with much of the mass so much higher, you can get things shifting around as they’re not as well-secured as they ought to be. The reality is that most people have *their own* way of doing it, and a lot of them work, some better than others, but if you take your time, you should be able to figure it out. My “favourite” improvisation was on the ferry to Manitoulin, using a 3 inch hemp rope from the ship; it was a pretty calm day so I basically draped the rope over the steering head, tied it as tight as I could to something in the floor and hoped for the best.